Wir haben seit dem Jahr 2000 und bietet Ferienhäuser. Bitte E-Mail oder rufen Sie Karen, der Besitzer, die Verfügbarkeit zu diskutieren. Wir können einen 2-tägigen Miete während der Woche unterbringen, haben aber mehr Minima über Wochenenden. Die Homeaway-System ermöglicht uns nicht, zur Eingabe in diesen Detailebene. Wir befinden uns auf der NV-Seite von Tahoe. Bitte erkundigen Sie sich nach dem genauen Standort. Dramatische, 4.000 sf Anwesen mit 6 Schlafzimmern, 3 Vollbäder, für 19 Personen. Begrünter Vorgarten perfekt für Kinder. Große Treppe mit dreißig Stufen hinunter zum Haus, nicht gut für ältere Menschen. - 520sf Wohnzimmer mit 12 Meter hohen Decken, Gas River Rock Kamin und einen großen Fernseher. Zu den weiteren Annehmlichkeiten gehören ein großer Whirlpool, ein Billardtisch, 2 Gaskamine, 6 TVs, Highspeed-Internet und große Terrassen mit Gasgrill und maßgefertigten Esstisch im Freien. Lange Treppe zum Haus, also nicht gut für ältere Menschen. Die Betten verfügen über 1 Doppelbett, 6 Damen und 5 Zwillinge. This place was amazing -- myself and a group of friends spent 3 days here in March for a mini-ski vacation and were not disappointed. It is conveniently located 10 minutes from Heavenly and close by the historic Zephyr Cove Resort & Lodge (phenomenal breakfast spot). 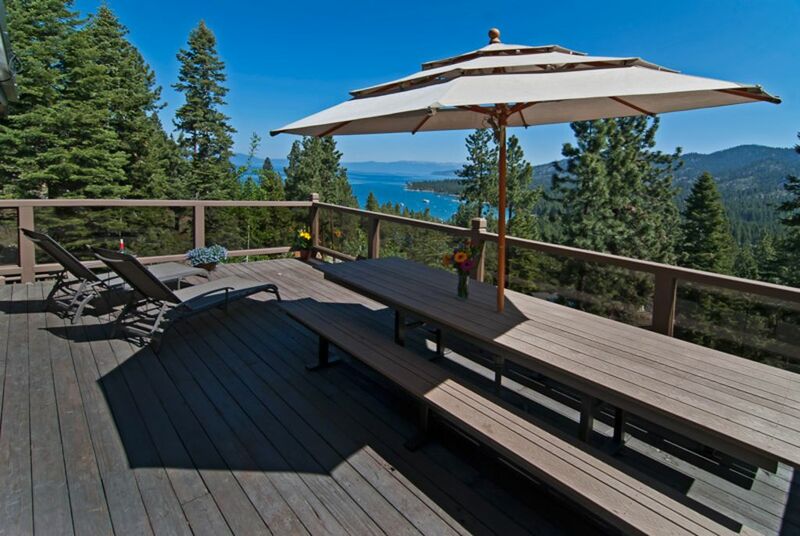 The views of the lake from multiple spot in the house are breathtaking and do not disappoint. I would definitely stay here again and highly recommend it to anyone who is interested in a classic, cozy and convenient and Lake Tahoe getaway. Was confusing finding the actual house, however Karen gives a good explanation on the paperwork she gives guests. A lot of stairs down to the house so not recommended for the elderly or disabled. Automatic lights did not work on the stair case so had to use cell phones. Rooms were a good size and clean. I wish there was some extra essentials like shampoo in the showers. Nice big kitchen! We couldn't get the thermostat to work. But Karen was very responsive/helpful and otherwise the house was beautiful, albeit a little difficult to find. All in all we had a great time in a big, wonderful house. Yes we are a little secluded! We switched out the thermostat as we discussed and all is good. It took 5 minutes and we could have done it when you were there if you let us know it was a continued problem. Thanks for choosing us! You were great guests. Great property and great location. We would definitely come back! We just finished a ski trip with a group of 12 men. The house worked great, accomodating our needs in the large kitchen and dining room table that could seat the entire group. We also enjoyed the hot tub , pool table, and large TV room. This home is perfect for a large group with more than enough sleeping space for 16 in beds as well as great communal areas. The kitchen is great for cooking large meals and the living room was perfect for watching the Super Bowl. The house is a quick 5 minute drive from Safeway which is a huge plus and an easy drive to the casinos and Heavenly Mountain. Our only complaint was that the hot tub did not work when we first got there and even when it was fixed it still did not get as hot as it was supposed to. Karen was very accommodating in getting this issue attended to quickly. 5 bis 10 Minuten zu 3 Stränden und der Innenstadt von South Tahoe / Casinos. Minimums vary as the rate chart is not very flexible. Inquire for specific rates/minimums. We own several homes, so if this home is not available, please inquire and we'll get back to you with some other options.